If you have an electronics bench, it follows that you will need some form of bench power supply. While many make do with fixed-voltage supplies it’s safe to say that the most useful bench power supplies have variable voltage and a variable current limiter. These are available in a range of sizes and qualities, and can be had from the usual online suppliers starting with a surprisingly small outlay. There is however a problem with inexpensive bench power supplies. They are invariably switch-mode designs, and their output will often be noisy. Expensive linear supplies provide a much more noise-free output, but do so at the expense of excessive heat loss when regulating a high voltage drop. One solution is a mixed-mode design, in which a switch-mode supply does the hard work of reducing the voltage most of the way, and a linear regulator drops the last couple of volts to provide a noise-free output. [Andrei] shows us his design for just such a mixed-mode supply, and it’s one you can have a go at building yourself. His primary supply is an off-the-shelf switcher that turns mains AC into 24 V DC. This then feeds an LTC1624 buck converter that brings the voltage down to about 1.2 V above the final output voltage, this is in turn fed to a parallel pair of LT3081 linear regulators that deliver the final noise-free output. There is an INA260 for voltage and current measurement, and an Arduino with LCD display as a user interface. His prototype has been nicely constructed using a four-layer PCB, though he suggests it could be made on stripboard with the appropriate SMD adaptors. The cardboard chassis he’s used looks slightly alarming though. We’ve covered numerous bench power supplies here over the years here at Hackaday. If it is an author’s favourite you are seeking though, take a look at the 723. If you stuff a computer into a rack with a bunch of other machines, you’d better make it a tough machine. Server-grade means something, so using server parts in a project, like this high-wattage power supply using server voltage regulators, can take it to the next level of robustness. But before [Andy Brown] could build this power supply, he had to reverse-engineer the modules. Based on what he learned, and armed with a data sheet for the modules, he designed a controller to take advantage of all the capabilities of them and ended up with a full-featured power supply. The modules are rated for 66 watts total dissipation at 3.3 volts and have a secondary 5-volt output. Using an ATmega328, [Andy] was able to control the module, provide a display for voltage and current, temperature sensing and fan control, and even a UART to allow data logging to a serial port. His design features mainly through-hole components to make the build accessible to everyone. A suitable case is yet to come, and we’re looking forward to seeing the finished product. Can’t scrape together some of these modules on eBay? Or perhaps you prefer linear power supplies to switched- mode? No worries – here’s a super stable unregulated supply for you. So Where’s My Low Voltage DC Wall Socket? What are the evocative sounds and smells of your childhood? The sensations that you didn’t notice at the time but which take you back immediately? For me one of them is the slight smell of phenolic resin from an older piece of consumer electronics that has warmed up; it immediately has me sitting cross-legged on our living room carpet, circa 1975. “Get ready for a life that smells of hot plastic, son!” John Atherton [CC BY-SA 2.0], via Wikimedia Commons. That phenolic smell has gone from our modern electronics, not only because modern enclosures are made from ABS and other more modern plastics, but because the electronics they contain no longer get so hot. 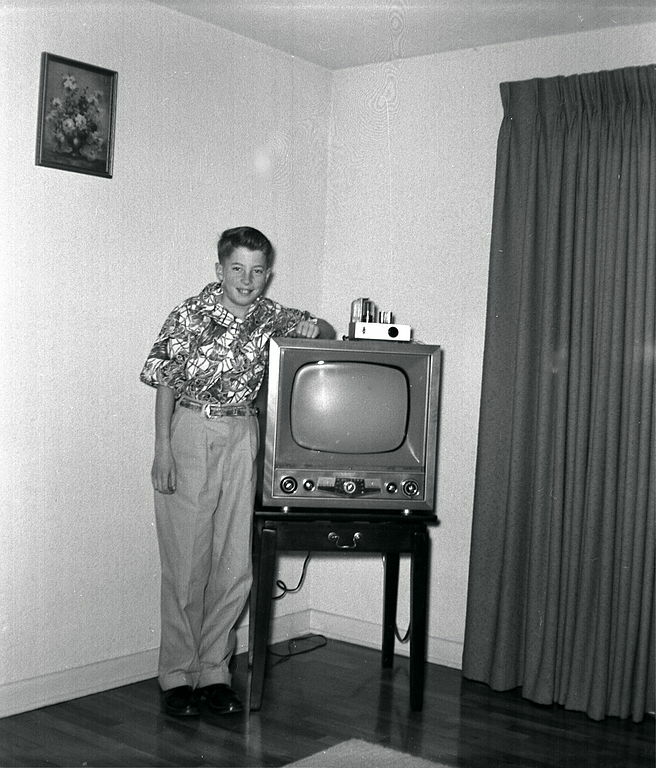 Our LCD TV for instance nowadays uses only 50 watts, while its 1970s CRT predecessor would have used several hundred. Before the 1970s you would not find many household appliances that used less than 100 watts, but if you take stock of modern electrical appliances, few use more than that. Outside the white goods in your kitchen and any electric heaters or hair dryers you may own, your appliances today are low-powered. Even your lighting is rapidly being taken over by LEDs, which are at their heart low-voltage devices. There are many small technological advancements that have contributed to this change over the decades. Switch-mode power supplies, LCD displays, large-scale integration, class D audio and of course the demise of the thermionic tube, to name but a few. The result is often that the appliance itself runs from a low voltage. Where once you would have had a pile of mains plugs competing for your sockets, now you will have an equivalent pile of wall-wart power supplies. Even those appliances with a mains cord will probably still contain a switch-mode power supply inside. “Chapter 5; Horowitz and Hill”. University students of all subjects will each have their standard texts of which everyone will own a copy. It will be so familiar to them as to be referred to by its author as a shorthand, and depending on the subject and the tome in question it will be either universally loathed or held onto and treasured as a lifetime work of reference. For electronic engineers the work that most exemplifies this is [Paul Horowitz] and [Winfield Hill]’s The Art Of Electronics. It definitely falls into the latter category of course books, being both a mine of information and presented in an extremely accessible style. It’s now available in its third edition, but the copy in front of me is a first edition printed some time in the mid 1980s. The Art of Electronics, on regulators. 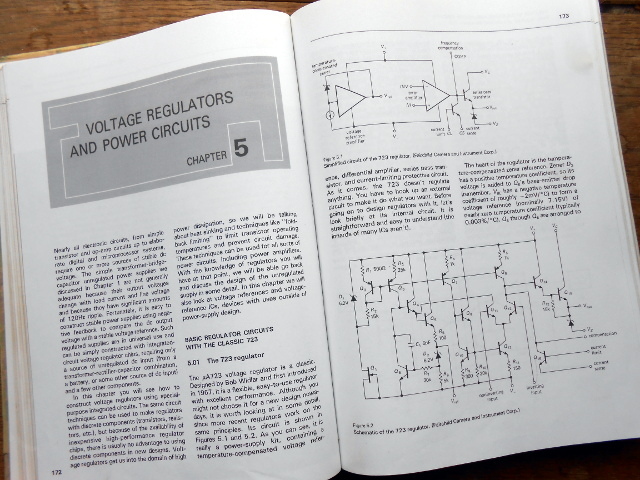 Chapter 5 probably made most of an impression on the late-teenage me, because it explains voltage regulation and power supplies both linear and switching. Though there is nothing spectacularly challenging about a power supply from the perspective of experience, having them explained as a nineteen-year-old by a book that made sense because it told you all the stuff you needed to know rather than just what a school exam syllabus demanded you should know was a revelation. On the first page of my Art of Electronics chapter 5, they dive straight in to the μA723 linear voltage regulator. This is pretty old; a design from the legendary [Bob Widlar], master of analogue integrated circuits, which first made it to market in 1967. [Horowitz] and [Hill] say “Although you might not choose it for a new design nowadays, it is worth looking at in some detail, since more recent regulators work on the same principles“. It was 13 years old when they wrote that sentence and now it is nearly 50 years old, yet judging by the fact that Texas Instruments still lists it as an active product without any of those ominous warnings about end-of-life it seems plenty of designers have not heeded those words. So why is a 50-year-old regulator chip still an active product? There is a huge range of better regulators, probably cheaper and more efficient regulators that make its 14-pin DIP seem very dated indeed. The answer is that it’s an incredibly useful part because it does not present you with a regulator as such, instead it’s a kit of all the parts required to make a regulator of almost any description. Thus it is both an astonishingly versatile device for a designer and the ideal platform for anyone wanting to learn about or experiment with a regulator. The PC power supply has been a standard of the junk box for the last couple of decades, and will probably continue to be for the foreseeable future. A product that is often built to a very high standard and which will give years of faithful service, yet which has a life of only a few years as the PC of which it is a part becomes obsolete. Over the decades it has evolved from the original PC and AT into ATX, supplying an ever-expanding range of voltage rails at increasing power levels. There have been multiple different revisions of the ATX power supply standard over the years, but they all share the same basic form factor. So a pile of ATX supplies will probably feature in the lives of quite a few readers. Most of them will probably be old and obsolete versions of little use with today’s motherboards, so there they sit. Not small enough to ignore, yet Too Good To Throw Away. We’re going to take a look at them, try to work out what useful parts they contain, and see a few projects using them. Maybe this will provide some inspiration if you’re one of those readers with a pile of them seeking a purpose.